So now that AM skis is known to the public, does any one have any info about Andy's new ski? does it sink if holes are drilled in it? I suspect that it will be built with a Toray T300 or T700 fiber. The T700g seems like a good option. My ski partner actually got to ride one a couple of weeks ago down in Orlando. He like it,said it was fast and a little more stable than the elite...I think it was still a little bit of a work in progress. I was also told they will be RTM. I pretend that I do not know anything.... but the truth is they are working hard to finalize everything before they say much. Clearly they are making skis. Adam and Andy need to be the ones that tell the world what is happening. I like that Adam is in this with Andy. Andy is awesome, but he's always built skis for Andy. I think Adam provides a good counterpoint in this venture. If they can re=create the red and blue Sixam, they'll have a winner. What made the Sixam good? I hear they are going to the next step beyond RTM. 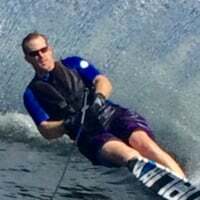 The old red and blue Sixam was a great ski -- first time I ran 38 was on that stick! Fast, stable, and smooth (although it did require some tweaks to get rid of the "sixam stall").